Why Are Android Users Unhappy? The bigger screens in the latest iPhones may be a factor. As users have come to depend on smartphones for more visual applications, they’re buying the biggest screens their hands and budgets can handle. Cook noted in the same call that switchers’ share of iPhone sales has been growing steadily since the 4.7-inch iPhone 6 and 5.5-inch iPhone 6 Plus debuted earlier this year. But bigger screens are just an equalizer for Apple, not a compelling reason to switch from Android. The Samsung Galaxy S6 and S6 Edge are second to the latest iPhones in sales; they have 5.1-inch screens, and the Galaxy S6 Edge+ has a 5.7-inch screen. The biggest Android smartphones all have 7-inch screens; anything bigger is usually called a tablet. The reasons people want out of Android are in the Android ecosystem itself. The complexity of the Android ecosystem is a major source of user disgruntlement. It leads to a confusing number of choices and to incredibly slow operating system update cycles. Both foster security vulnerabilities. Google distributes Android to phone makers free of charge. The vendors customize Android to take advantage of their unique hardware, or just to differentiate their products superficially. Then the cellular carriers who actually deliver most of the phones add their own apps, icons, restrictions, and cosmetic changes. The result is that one Android phone may have a very different user interface than another. An HTC phone from Verizon will be a steep learning curve for the owner of a Samsung phone from T-mobile. Here's one from my own experience. I recently switched from a Samsung Galaxy S4 to the Motorola Moto X. (I couldn't resist the price, just one cent at Staples!) It's a great phone, but the Back button is on the left instead of the right. And there's no Options button at all. Things work a bit differently in the Phone, Contacts and Messaging apps, too. So I've had to get used to a different way of using my phone. The long distribution chain makes for long upgrade cycles. 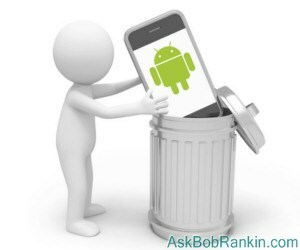 When Google releases a new version of Android, it can take years for it to filter down to end users. (Unless you bought a Nexus phone directly from Google.) Each new Android version must be customized all over again at the OEM (phone manufacturer) and carrier levels, a process that takes time and resources. OEMs and carriers have higher priorities. And as a rule, they release Android upgrades to their flagship phones first, and then work down the chain. If you have a phone that's more than two years old, it may never see an operating system upgrade. As of October 2015, Android KitKat is still in use on over 38% of Android devices; it was released in late 2013. (In contrast, more than 50% of Apple devices were automatically updated to iOS 9 within days of its release.) This is actually a mixed blessing for some users. When those Android updates DO arrive, they often are disruptive, requiring relearning how to do things, or changes to the way you work. If you've had the experience of moving to Windows 8 from a previous version of Windows, you know exactly how this feels. Let me add one more personal data point here. At least on Samsung Galaxy models, the latest Android 5.0 upgrade is causing some phones to have sluggish performance and battery drain issues. My wife has experienced both of these recently, to the point where she's saying "I want an iPhone!" Personally, I prefer the Android experience. That's probably because I enjoy dealing with gadgets, upgrades and the challenges they bring. But I understand that most people just want the darn thing to work reliably, and they want things to work the same from one day to the next. Many Android fans are repulsed by Apple’s high-handed, controlling ownership of the iOS ecosystem, as well the relatively high prices of Apple products. But according to Tim Cook, tens of millions of Android users have come to appreciate the consistency and efficiency with which Apple runs its tight ship. Most recent comments on "Angry Android Users Defecting To Apple?" AT&T gave me an LG android phone when my old phone aged out (they were changing the network and they said the old one wouldn't work in most places). Pro's; it works ok and has a good camera. Con's;it is needlessly complex, it likes to take pictures inside the case without human intervention, it came loaded with useless apps. If I have to have a needlessly complex phone I will get an Iphone next time; that way my daughters can fix anything I don't feel like learning. You mentioned problems switching phones from different models and different carriers. I recently upgraded from a Galaxy S4 to a S6, both with Verizon. It's still a learning curve. I think that they feel if they don't move things around every once in a while, they're afraid of "not improving." Of course there are things that the S4 did that I liked that the S6 does not do. Hurrah for improving, thanks a lot Verizon! My biggest gripes with most smartphones are lack of user replaceable battery (especially when you can't get a day's worth of use out of the installed one), lack of user added storage, and the size they've become. After all the news about Android's insecurity and the high cost of iPhones, I'm in no rush to buy either. Add to that the cost of reliable cell service and it's all just too inconvenient for me. I don't need to be in constant contact with anybody. Hmmm... maybe a refurbished 5th generation iPod Touch used with wi-fi! My wife is uncomfortable with technology. In fact, she still uses a feature phone, also known as a flip phone. But she doesn't like the postage-stamp size of the photos she receives attached to text messages, and we're talking about getting her a smartphone. Because she doesn't relate well to anything that is might have a chip in it [with the exception of the microwave], I've been considering getting her an iPhone. Bob, your article gave me another nudge in that direction. Thanks much for a very informative article. I have to say that I agree with Moxie. I also have a Samsung Note 4 and love it. The battery life seems okay to me, and I have never had problems adjusting to changes. No Apple products for me! I agree with Earle McNeil re windows based phones. I have a Nokia Lumia and absolutely LOVE it! Have no idea why these phones have not been more popular. They are incredibly intuitive and easy to use - way better than either the iPhone or any of the android phones, in my opinion -, reliable, customizable, and cheap! I will be very upset if windows based phones disappear off the market. For my money, they beat all the others hands down. I looked at an Android 5.x phone a few months back that had the button switching that Bob mentioned, but there was an option in Settings to flip it back to the way I was used to from my previous Android devices. Regarding battery usage, I purchased an S6 to replace an S3 a few months back. I had issues with the battery not lasting the entire workday, or just barely. I then turned on the built-in power saving feature (swipe down and scroll to the right), no problems since. I'm surprised that Samsung didn't make power saving on by default, it's that good. My wife and I have Android-based Samsung Tab 2 10.1” tablets, which are adequate for the purposes for which we bought them; however, we plan to replace them with Windows-based tablets in the future. Like many Android users, I despise Apple’s high-handedness and high prices –- a dislike acquired in the 1980s, due to Apple’s refusal to open their architecture sufficiently to enable participation by 3rd party vendors. On the other hand, among the reasons I dislike Android are its lack of user-friendliness (for semi- geeks like me, at least) and the slow-roll process for patching the OS (if it gets patched at all). I’m rather fanatic about security, so Android’s pathetic patching process is a major issue for me: we don’t do any banking on our Samsung tablets. My wife and I upgraded, in December 2012, to Lumia 822 smartphones, which are now running Win 8.1 –- which we love. I’m anxiously looking forward to the release of the Lumia 950, since I like to read news, books, and other documents on my phone fairly often: the 950’s larger screen will be very helpful. We skipped Win 8.1 for our desktop PCs, since we do not have touchscreens and we strongly prefer having the Start Menu when using a mouse: instead, we migrated from WinXP to Win7 to Win10. My deep frustration with Android is how apps update. I've gotten to where I won't update but a precious few apps, because I learned months ago that when many apps want to do 'performance enhancements, a lot of times it screws with the app or changes it considerably. When an app is working fine, I leave it alone, because to me, the risk factor in updating it is greater than the risk factor of not upgrading it. I was long overdue an upgrade from my Pantech Ease. Thus, my AT&T contract was expired. I didn't want a phone with an expensive new contract. So,, I bought a refurbished Samsung Galaxy S5 which cost as little to run on our family plan as my wife's very old technology cell phone. Thus, I have saved a good amount of money and I like my phone just fine. Yes, I'm thinking of switching from Android to IOS because my Android phone (a Huawei Ascend Mate 2) is still running Android v4.3. (It has not been upgraded in the two years I've had it.) And, it's showing its age because I cannot run newer apps like Android Pay, which is incompatible with Android 4.3. I retired from one of the two largest carriers, so I speak from much, much experience. I'm anti-Apple anything, mostly because it's stupidly over-priced for the same products. That being said, from the beginning when they first released Androids I've been hooked. I've had all kinds of phones, Motorolas, HTC, LG, Samsung. I keep going back to Motorola. I love the Droid Maxx and the next phone will be a Moto as well. I have so many friends with iPhones and all they ever have are issues with sluggishness, with connections. I never have those problems, so I guess I'm an android person for life. I will NEVER EVER switch to an iphone. They are nothing but a status symbol. Too expensive for what you get and apps are limited. If some company only has apps for an iPhone I will not buy from them. Give me anything but an iPhone!! I'm one of those folks who finds Apple products very confusing and not user friendly at all. I'll take Android any day. To me it's very simple to learn, and prices won't break the bank. I love my Galaxy 4. User of Using a Samsung3 and yes, I am having battery drain issues, big time but until the iphone starts using an SD card, I won't even consider a switch. I've never been keen on having an iPhone. Have used BlackBerry for several years now and recently purchased a Blackberry Passport on EBay (2nd hand but in excellent condition.) I get 3G and 4G through EE (part o the Orange Group in the U.K.) I'm Really pleased with the phone performance and get up to 18 hours use from one charge if I am acreful with WiFi usage. Apps are improving all the time as I use the phone as a book reader (wide screen 66 characters) and can view spreadsheets, circuit diagrams etc easily. The apps and OS prompt or update automatically when I connect to WiFi at home each day and I'm not charge for this! It would be interesting to hear whether anyone else has switched to Blackberry - I know we can all have glitches with the multitude of OS's, hardware, software and apps but I'm feeling quietly smug with my choice at the moment. My wife and I are both on Credo, which is a Sprint network re-seller. A year ago, we upgraded to Nexus 5 phones. My wife lost hers, and now has a Galaxy S4. My Nexus was upgraded to Marshmallow withing days of release, but the S4 is still running Lollipop, and I'll wager it won't ever get the latest OS. I'm a fan of having the latest OS, be it phones or PCs. We're due for a free upgrade in a year, and will decide then if we want to go over to the dark side and get iPhones. EDITOR'S NOTE: It's still on the Staples website.